When I first started this campaign, I promised the people of Vermont that I would speak truth to power and be vulnerable. 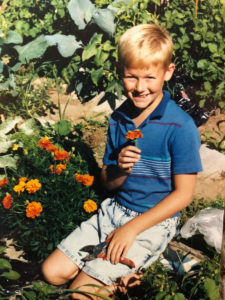 Part of what that means is sharing some of my life stories, so that you can get a sense of some experiences that have helped shape my life—experiences that have made me the man I am today, someone who has a deep knowledge of what it is like to grow up here and the community spirit that helps us feel like we belong. Throughout much of my childhood my family was in and out of poverty. Though there were constant struggles to pay the bills, we made do with what we had. Today, in many ways I now consider myself very lucky to have grown up poor, as it has given me a different perspective on life and how I treat others. I can’t help but remember that cold winter’s night my family ran out of heating fuel. My mother gathered all us kids into the kitchen, closed off the rest of the house the best she could, and we huddled around the open door of the oven to stay warm. For many, this difficult moment could have led to frustration or anger with their circumstances, but not my mother. Instead, she consciously decided to shield us from the pain. She made us all popcorn and somehow made it into a fun campout in the kitchen. I now know this was an act of pure selflessness. This was an act of bravery and love. The lesson I learned was this: in the face of adversity, choose the positive, choose to be grateful for the simple things, and choose to lead with love. Growing up poor, I knew the constant worry my parents had around money and paying for all bills, including healthcare. At 10 years old I was keenly aware that any extra cost to our household would mean added stress and hardship. So, when I started to have a sore throat I remained silent, hoping it would go away. After a week or two it eventually did, but what I didn’t realize is strep throat, left untreated, can attack other organs. I began urinating blood and still remained silent. Nobody asked me to, nobody ever said, don’t speak up if you don’t feel well, but the voice in me knew this problem would cost us money we didn’t have. As time passed, I grew weaker and weaker. The virus was attacking my kidneys, causing serious damage, which left untreated, would have resulted in kidney failure. I won’t go into the particulars, but after feeling so weak and scared, I decided at last to speak up. I was rushed to the emergency room and was diagnosed with a kidney disease. At first, doctors were unsure how much damage had been done, or if I needed to immediately start dialysis. Through all this, I worried I had done something wrong; I worried I had brought hardship on my family. That is a lot of weight to place on a 10 year old, facing an uncertain future. I am running for office today to say: no child in America should ever have to bear the worry of healthcare costs, and no parent should have to watch their child suffer in sickness with the added stress of how they will pay for treatment. This is an inhumane burden we place on our children and their families every day in this country. Healthcare is a human right, and every American should have access to affordable treatment. This means passing legislation for a universal healthcare system. Think of the anxiety we could eliminate from millions of Americans, if we all knew we would receive dignified healthcare, without the weight of financial hardship. This is the way we grow as a country, and this is possible when we all think bigger, look out for one another, and move forward, together. I was 17 when I first started seriously thinking about college, but knowing the financial burden it would place on my parents and myself, higher education did not seem possible. When the financial aid packages arrived, it became clear: college was not an option. My best friend was going into the Marines, and my family has a history of military service, so I began weighing my possibilities. My late grandfather Bob Svitak was an Air Force man, and my uncle was a Navy man. I have heard many stories about their service, and the opportunities it gave them to see the country and the world. I idolized my grandfather, so I thought perhaps the Air Force was my way to a better future. I would like to point out that our military relies heavily on working class and poor young men and women, since for most it is their only way to break the cycle of poverty, and earn a chance at a better future. My plan was to serve my time, and utilize the benefits of the GI Bill, thus fulfilling two dreams: service to my country and eventually graduating college. At 18 without my parents’ knowledge I went to the recruiting office and voluntarily enlisted. I remember how proud my grandfather was that I was following in his footsteps. Off to basic training I went, where I was under no illusion of the difficult transition ahead. I remember how scared I was that first night, ushered off the plane in Texas, placed on buses in complete silence until we arrived on base, and then a lot of yelling, and picking up and putting down our bags until we were in total unison as a team. I won’t bore you with more details of the training today, but suffice it to say it was a rapid period of growth. My parents made the trip to San Antonio for my graduation ceremony, and I was excited to introduce them to my new friends and give them a glimpse into my military life. In that short period of time, I had gained confidence and purpose, while connecting with my fellow brothers and sisters from all across the nation–every race, religion, and culture coming together to grow as a team and defend this country. I had proven I could make it on my own, and believed great things were in store. Directly after basic I went to tech school for my security forces education. During this time, I began to change. What I had suppressed for so long began knocking on my soul. My service, my brotherhood, my bond to the people around me grew stronger, yet I couldn’t confide in anyone, because if I did, everything I had worked so hard for would be taken away. I started feeling depressed. I graduated tech school, but before heading to Shaw Air Force Base for my first tour, I was granted 30 days of well-earned leave. 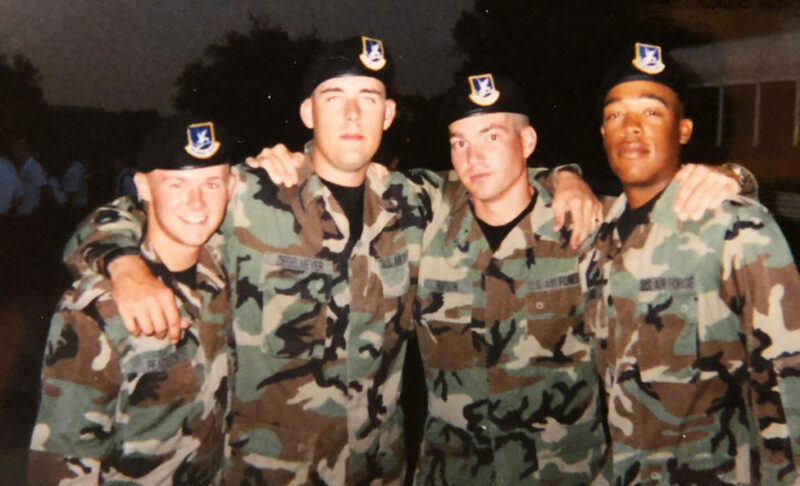 I was so proud to have earned the security forces badge and beret, and I remember arriving at the airport feeling 3″ taller in my dress blues, with a sense of accomplishment I had never felt before. I was greeted at the airport to a hero’s welcome by my entire family with a huge sign that read, “Welcome home Brad, we are so proud of you.” Back home, I remember feeling like I was contributing to something larger for my community. When I arrived in South Carolina, however, things quickly deteriorated. I was becoming further depressed and most nights couldn’t sleep. I would wake up at 1, 2, 3 in the morning and go out to the track and run, sometimes for hours just to suppress the pain. I started isolating myself from friends and spiraled into deep depression. Here I was, surrounded by people who genuinely cared for me, in a stable environment for one of the first times in my life, and I had to hide who I was. I finally started seeing a therapist on base, and my life was about to change forever. I came out as a gay soldier. The reaction was swift. Because of the disastrous policy of Don’t Ask, Don’t Tell, a policy cloaked in discrimination, I was released from the military for being gay, though they labeled it an “anti-social personality disorder.” Discharged from the family I had created, and for simply being who I was. Rejected and sent home feeling like a disgrace. After volunteering to serve, after raising my right hand and swearing to defend, protect and give my life for this country, I was discriminated against by my government. There would be no GI Bill for me, no support system, and there would be no hero’s welcome home this time. Only lots of questions, concerns, lies, and so much shame it almost made me pull the trigger and end my life. Because how could I face my family, my friends, my community as a failure? How many brave men, women and trans people have taken their lives because of the shame our government has placed upon them, for simply being who they are? In the many months following my discharge suicide was a daily battle. But I endured because of my family, friends, and you Vermont. It was because when I finally decided to come out, I was met with love and acceptance from folks all across this state. I still got stopped to ask how I was, I still got hugs, I still received the flick of the wrist waves I have come to cherish here. What I would like everyone to understand is that these small acts of kindness can change the course of someone’s life. Please do not underestimate the power of kindness to others. I owe my life to the people of this state, the people who make our communities the open, accepting places they are.